It was a truly brilliant season for Packers quarterback Aaron Rodgers. 4,643 passing yards. 45 touchdown passes against only six interceptions. A 68.3 completion percentage. A record setting 122.5 passer rating. His team has the best record in the NFL and had a legitimate shot at an undefeated regular season and only lost once. And today he was named Most Valuable Player for the 2011 NFL season. 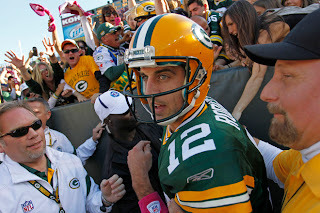 Rodgers is the first Packers to win MVP since Brett Favre concluded a run of three straight MVP's in 1997, becomes the fifth Packer all time to be NFL MVP (Favre, Paul Hornung, Jim Taylor, Bart Starr) and the three consecutive quarterback to win the award (Tom Brady in 2007 and 2010, Peyton Manning in 2008 and 2009).